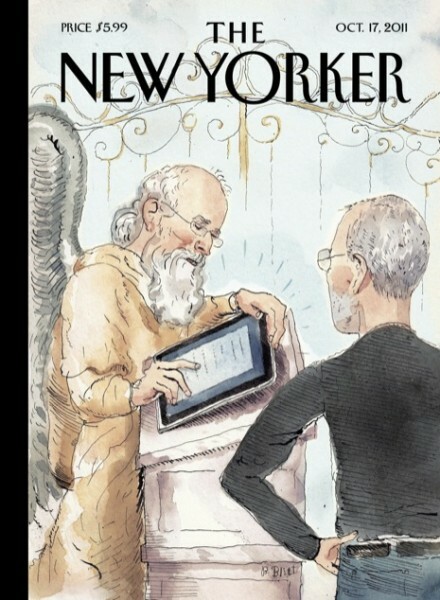 In case you haven’t seen it, Steve Jobs teaches Saint Peter how to use an iPad at the gates of heaven on the cover of this week’s New Yorker. Hopefully St. Pete can read anything off the Apple tablet with the glare of God beaming down on the screen, but what really confuses me is that Steve Jobs was a Buddhist. Shouldn’t he be depicted as something like a reincarnated bunny rabbit holding an iPod shuffle instead of the Christian version of the afterlife?